Steve Moore played 69 career regular-season games for the Colorado Avalanche. None of them were after March 8, 2004. Yes, Thursday is the 14th anniversary of one of the most notorious incidents in Avalanche history. More than a decade later, it might be easy to forget just how notorious it was, even internationally, generating heated debate and thoughtful discussion about the role of “The Code” in the NHL and the North American pro game. I covered it — the buildup, the incident itself and the aftermath. As the anniversary approaches, here’s a reminder of the narrative. The Avalanche was 32–11–10–4 when it faced Vancouver at the Pepsi Center on February 16, 2004. Rookie center Steve Moore, a Harvard graduate from the Toronto suburb of Thornhill, was having a solid, if unspectacular season for the Avalanche, showing he might be destined for a journeyman’s career in the NHL. In the second period that night, Moore delivered an unpenalized, open-ice hit on Canucks captain Markus Naslund, and the Swedish center suffered facial cuts and a minor concussion. The Canucks won 1–0 and all but announced after the game that they would seek revenge. I was among those in the Canucks’ dressing room that night and was part of the questioning of Canucks winger Todd Bertuzzi. I asked him if he meant the Canucks might have retaliated if the game hadn’t been close. Nearby, Canucks winger Brad May made what turned out to be an infamous remark to Vancouver Sun writer Iain MacIntyre, referring to a “bounty” on Moore. Outside the locker room door, Canucks coach Marc Crawford delivered a stinging rebuke to Moore and the referees. “They talk about players not having respect for players. How about the officials?” the former Avalanche coach asked. “Should they not have respect for the leading scorer in the league? When does that come? It could have been an obstruction call, it could have been an elbow call, and it could have been anything. Instead they call absolutely nothing. After hearing all that, I scrambled over to the Avalanche dressing room to get Moore’s explanation and his reaction to what we had just heard. Crawford took the same stance when he coached the Avalanche and called for officiating respect and protection for his star pick-your-poison centers, Peter Forsberg and Joe Sakic. I considered his rant lobbying, the sort I heard all the time in decades of being around the NHL. At times, it seems contradictory because it runs against what the culture proclaims as the all-for-one, one-for-all fabric of the sport. But it wasn’t getting Michael Jordan to the line every time he was touched or looking the other way when he didn’t dribble for five strides on the way to the hoop. It was physical protection in a tough sport. The Avalanche and Canucks met again in Denver two weeks later. I talked with Moore about the upcoming game following a morning skate in Columbus and also set out to tell readers more about the player who, until the Naslund hit, had stayed under the radar. All three boys gravitated to hockey. One by one, they attended Harvard and played for the Crimson. Mark was a defenseman who signed with the Pittsburgh Penguins’ organization. A year behind Mark, Steve starred for four seasons, becoming the Crimson’s all-time scoring leader. The Avalanche drafted Steve in 1998, after his freshman season, using the number 53 overall choice late in the second round. 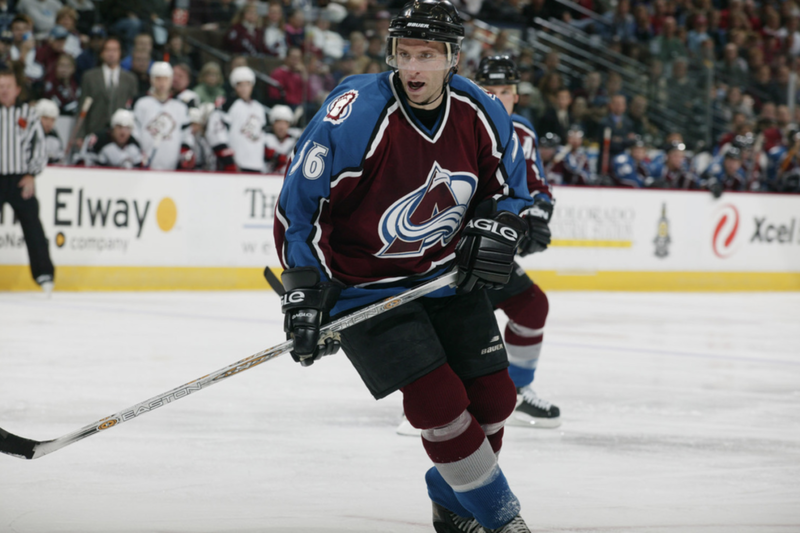 After signing in 2001, Moore played 12 games for the Avalanche during callups in his first two pro seasons. In 2003–04, still officially an NHL rookie, he got the summons from the Hershey Bears of the AHL again in late October and by March seemed to have cemented a spot on the playoff roster for coach Tony Granato. So what happened during that March 3 game in Denver? It was a 5–5 tie and gratuitous stupidity would have been potentially costly. Also, NHL commissioner Gary Bettman and discipline czar Colin Campbell were at the game. Bettman told us after the first period that he was on the way to an appointment on the West Coast and just felt like stopping in Denver to watch a game. Bettman played down the Canucks’ remarks about Moore. Five days later, the teams played again in Vancouver, and again it was my turn to be there. With the game still scoreless at 6:36 of the first period, Moore was challenged to a fight at a faceoff by Vancouver forward Matt Cooke and held his own. By some standards of “The Code,” he had answered the call, and that should have been it. The Avalanche roared to a 5-0 lead by the end of the first, and Moore had the fifth goal — his fifth of the season. It was 8-2 as the midway point of the third period approached. Bertuzzi stalked Moore, grabbed his jersey with one hand and and and threw a roundhouse punch from behind to Moore’s head with the other. Bertuzzi drove Moore to the ice near the red line, and kept punching. The most ridiculous thing to come out of the incident was the contention that Moore suffered his injuries when teammates joined the pile, trying to break it up. It could have been worse if Avalanche center Andrei Nikolishin hadn’t interceded and pinned Bertuzzi’s arms. Bertuzzi wasn’t going to stop punching on his own. I wasn’t watching the ice when it happened. We faced tough deadlines on all West Coast games, and with the outcome not at all in doubt, I was writing. So was Aaron Lopez of the Rocky Mountain News, who was next to me. Plus, this was the eve of the trading deadline, and the Avalanche had announced after the first period that they had acquired forward Matthew Barnaby from the New York Rangers, and we met Avalanche general manager Pierre Lacroix for a briefing. So we were writing that trade story, too. We were like everyone else who hadn’t been focused on the incident, which happened behind the puck: we had to catch up by watching replays. In the ensuing mayhem, with Moore down on the ice amid blood, Crawford was shown on television behind the bench, smirking. I’ve often been asked how I could remain civil with him when I encountered him in his later coaching stints at Los Angeles and Dallas. (He’s now the Ottawa Senators’ associate coach.) It was easy, and if that makes me hypocritical … guilty. I liked him when he coached the Avalanche, I liked him after he left, and although we haven’t run across each other much in recent years, I still like him. For one thing, I “got” his sharp-edged sense of honor, and it could seem as if he was sharing inside jokes with those who did. More important, the former lunchbucket NHL forward was a walking representation of the traditional mind-set so tied to this “incident.” To focus on excoriating him as the single culprit ignores the larger issue. This all happened at 8:41 of the third period. In the mess that ensued, Granato stood on the bench and yelled at Crawford. Moore was down on the ice for about 10 minutes before he was taken off on a gurney. Because of the subsequent skirmishing, Avalanche enforcer Peter Worrell drew a game misconduct, and as he headed toward the tunnel to the dressing room, he paused and needed to be restrained from trying to get in the stands. Another ridiculous view aired in the wake of the incident was that it was somehow Granato’s fault for having Moore on the ice at that stage of the game in a blowout. What was Granato — now the coach at the University of Wisconsin and last month also the coach of the U.S. Olympic team at PyeongChang — supposed to do, double-shift Joe Sakic? Wouldn’t keeping Moore on the bench have been considered cowardly, anyway? The Avalanche ended up winning 9-2, with Milan Hejduk getting a hat trick and Sakic a goal and three assists. After the game, with Moore off at a hospital and with no information regarding his condition available, the atmosphere turned somber. In the Avalanche dressing room, the rhetoric was restrained. In a sport that prides itself on team togetherness, only defenseman Derek Morris—who until then was most notable for being acquired from Calgary in the October 2002 deal that sent the popular Chris Drury to the Flames—took off the muzzle. After the game, Bertuzzi — who had drawn a match penalty — didn’t speak to the media. Crawford was subdued. The major reason the Canucks were upset, of course, is that everyone suddenly realized the potential consequences. I’m not saying there wasn’t concern for Moore, who at that moment was in the hospital, and an acknowledgment that things had gotten out of hand, but that was secondary. The Canucks figured out that this wasn’t going to go away. Another of the twists was that Crawford and former Avalanche winger Mike Keane, who on that night was playing for Vancouver, both had been so disdainful of the Red Wings waiting for a home game at Joe Louis Arena (specifically on March 26, 1997) to target Claude Lemieux in the wake of the Lemieux hit in the clinching Game 6 of the Western Conference finals that left Detroit’s Kris Draper with horrific facial injuries. In this case, the gasoline on the fire was that the game was so out of hand. The Avalanche stayed overnight in Vancouver. The next morning, the team put out a release that Moore had suffered fractured neck vertebra, a concussion, and cuts. The term “broken neck” also informally was used, and that raised the specter of possible paralysis. The NHL announced Bertuzzi was suspended indefinitely, pending a disciplinary hearing. Also, the Avalanche announced that morning that Morris and the rights to prospect defenseman Keith Ballard had been traded to Phoenix for veteran center Chris Gratton, defenseman Ossi Vaananen, and a second-round draft choice. The Avalanche also acquired veteran goalie Tommy Salo from Edmonton. With all that going on, Lacroix and Granato appeared at a news conference at a Vancouver hotel. Lacroix said he was able to see Moore in the dressing room during the third period. Granato said the incident cast a pall over a significant road win. As a player with the Los Angeles Kings, Granato underwent brain surgery in February 1996 after suffering head injuries after being driven into the boards. The Avalanche said Worrell wouldn’t be able to talk with me until later that day in Edmonton. The team had decided to make an exception on the trip and invited Lopez and me to be in the traveling party for the day. Our bosses agreed to it. That meant that rather than take our ticketed commercial flights to Edmonton, where the Avalanche was playing on March 10, we went with the team to the Vancouver General Hospital to visit Moore and then joined the Avalanche on its chartered flight to Edmonton. When the team visited Moore, we first waited in the hospital’s fourteenth floor rehabilitation gym. Players leaned on workout equipment, talking softly, and watching the double-door entrance. Moore, sitting up in a raised bed, his neck in a long cervical brace, was pushed into the room. His teammates applauded. If they had sticks, they would have tapped them on the floor. There were some positive signs. He was conscious and coherent, had the use of his limbs, and managed to smile. Avalanche trainer Pat Karns gave a quick briefing on Moore’s condition. Moore, he told his teammates, had cuts, a concussion, and two chip fractures in the C-3 and C-4 vertebrae in his neck. “Looks worse than it is, though, right?” Moore asked. Softly, Moore briefly addressed his teammates. He told them again he was going to be all right. “I just have to wear this stylish brace for a while,” he said. Granato said Moore would be in everyone’s prayers and that they knew his family was worried and supported him. One by one, teammates approached Moore, spoke with him, smiled, and grasped his hand. Moore was wheeled out, and the Avalanche players filed out. Next, the team, plus Lopez and me, traveled to Edmonton. At the Hotel MacDonald, I patiently waited to speak to Worrell. The reason I had to wait was that Granato pulled him aside and had a long conversation with him. Standing close to the huge winger and looking up at him, Granato seemed to make several points. Worrell nodded and when I talked with him, said nothing beyond the benign. When I asked him point-blank if the fans or the Canucks had been directing racist comments at him, as I had heard from some folks within earshot, he said no. I’ve always assumed that Granato told Worrell the situation already was stormy enough and that it would serve no useful purpose for him to add to the turmoil. I don’t know that, but it’s my guess. The firestorm was international in scope. I appeared on National Public Radio’s All Things Considered to talk about it, and I also cranked out an ESPN.com column. On March 10, or two days after the incident, Bertuzzi spoke at a media availability before the Canucks played the Minnesota Wild at home. He was tearful as he read a statement. Reading, he also said he was sorry to his teammates, Burke and the organization. Moore ended up being hospitalized for two weeks, in Vancouver and also at Rose Medical Center in Denver. On March 29, he appeared at a pregame news conference at the Pepsi Center. He still was wearing a cervical collar that reached down to the center of his chest. He declined to answer when asked if he thought Bertuzzi should face criminal charges or if he was considering a lawsuit. At that point, Moore had rebuffed approaches from Bertuzzi’s agent, Pat Morris, as Bertuzzi attempted to more directly apologize to Moore. Actually, there was plenty of blame to go around, as Moore’s legal team later recognized with lawsuits that sought at various times to include Burke, May, and Crawford as defendants. The man we let off the hook was Markus Naslund. He’s a nice guy who comes from Ornskoldsvik, Sweden, the same hometown as Forsberg and several other NHL players. He was the Canucks’ captain. For team-oriented reasons, he should have seen that the preoccupation with Moore was counterproductive. At any point, he could have stepped in and said, “Guys, I appreciate this, but enough’s enough. Let’s get on to the business at hand.” That especially could have been the case after Moore fought Cooke and as it became apparent that there might be some ugliness in the third period. I’ve even wondered why Trevor Linden, as the NHLPA’s leader, wasn’t more of a voice of reason. The highly educated and erudite Burke’s rhetoric and attitudes were especially bewildering. Bertuzzi has to be responsible for his own actions, but he also was caught in the crosscurrents of events and rhetoric that other, more intelligent men in positions of power and influence could have influenced. That said, I’ll concede that much of the criticism and even grandstanding about this incident from the media folks and others who didn’t know the color of the blue line. It would have been funny to watch and hear allegedly savvy sports journalists try to fake knowledge of hockey if it hadn’t involved such serious issues. Yet all of that that also overlooked the fact that by far the most intelligent discourse and analysis about what this meant about the fabric of the sport came in Canada, including from some former NHL stars. As time went on, the mindless wing usually resorted to saying, “Let it go!” Those were the folks who argued we should pretend that because the NHL reinstated Bertuzzi after a 17-month suspension that ran through the lockout season and because Bertuzzi received only probation and a slap on the wrist from legal authorities before Moore filed a civil lawsuit, it was time to move on. Plus, that argument went, he had been held accountable. At least early on, this was about a sport unwilling to hold itself up to ruthless self-examination. The NHL didn’t forget the lessons learned; it never learned them at all. This incident didn’t involve “enforcers,” who in addition to policing the ice more often fought each other in contrived sideshows outside the realm of accountability, and that specialist role has been additionally downplayed since 2004. (The 2017-18 Avalanche, while having a handful of players willing to drop the gloves, doesn’t have an enforcer.) But “The Code” still is out there. Moore wasn’t popular among his teammates primarily because he was quiet and he was a Harvard boy. I’m not saying he was unpopular, either. He just wasn’t one of the boys. The Avalanche initially showed considerable concern and helped both Moore and his family. But the Avalanche’s 2005 signing of Brad May, who ended up playing with Colorado for one season and part of a second, was bewildering. But it also was part of a league-wide collective shrugging of shoulders. Once Moore was on course to sue, it seemed clear the Avs had been told to avoid any open association with their former forward, ruling out a Steve Moore Night, for example. Even Hockey Canada, which aired terrific television ads promoting respect in its sport from the stands to the rink itself, sent mixed messages by going along with Bertuzzi being invited to the 2006 Olympic team orientation camp after the NHL reinstated him and then accepting his inclusion on the team that didn’t win a medal at Turin. In August 2005, or 17 months after the incident, I visited Moore in Thornhill. I talked with him on the phone for several weeks as he visited the Cleveland Clinic periodically for testing but didn’t write anything as we laid the groundwork for a visit. When I got to Thornhill, he wouldn’t discuss the specific incident. Moore hadn’t yet filed a lawsuit, but in 2004, he had hired a prominent Toronto attorney, Tim Danson, and Danson told him not to talk about what happened. We did have long talks and also visited the local rink where he had played as a youngster. At the time, he still, officially at least, was hoping to get clearance from doctors to play. I was ambivalent about Moore filing a lawsuit. Part of me always has believed there’s an implied consent involved in playing professional sports, and you’re agreeing you’ll leave issues up to the leagues involved. Part of me wants the courts to stay out of sports, period. But this ended a career. It wasn’t so roundly criticized when Dennis Polonich sued Wilf Paiement, as I recall, and Polonich even came back and played several more seasons in the NHL. That all came after Paiement, then with the Colorado Rockies, nailed Polonich, then with Detroit, in the face with a swing of his stick in an October 1978 game in the Olympia. Polonich suffered a broken nose and later argued he had considerable physical problems tied to the injury. It was a different time: The swing wasn’t captured on film … or anything else. Paiement was suspended 15 games and a United States District Court jury in Detroit awarded Polonich $850,000 in 1982. Moore’s camp, working with Denver attorney Lee Foreman, originally sought to sue in Denver, based on the theory that the incident “started” at that Pepsi Center game in February 2004. Moore appeared at a hearing on jurisdictional issues in Denver District Court in October 2005. I was among the group of reporters, some of them from Canada, speaking with Moore after the hearing. Moore said he still was skating and working out and hoping to overcome post-concussion issues and return to the NHL. At that point, Lacroix had told Moore the Avalanche would re-sign him if he were able to get clearance to play. The NHL’s lockout had ended, and the 2005-06 regular season was on the verge of opening. “It’s tough to see everybody go back to work, when I can’t,” Moore said. Later that month, Denver District Judge Shelley Gilman sensibly ruled the case was inappropriate for the U.S. court system and it needed to be filed in Canada, if it was filed at all. In February 2006, just under the wire in Canada’s two-year statute of limitations, Moore’s suit against the Canucks and their ownership company, Orca Bay, plus Bertuzzi, was filed in Ontario. The suit originally sought $19.5 million. That figure eventually grew to $38 million. The legal case remained pending for several years, with the scheduled trial date repeatedly pushed back. By October 2008, Bertuzzi had been with several teams since the incident, but the constant was that fans booed him in the Pepsi Center each time he touched the puck. The only Avalanche players remaining from the 2003-04 team were Sakic, Adam Foote, John-Michael Liles and Milan Hejduk. Sakic and Foote had been Bertuzzi’s teammates at the 2006 Olympics. As the Avalanche was about to face Bertuzzi and the Flames in the Pepsi Center, Sakic openly acknowledged that he and his wife Debbie had been part of a group vacation to a Mexico resort that also included Bertuzzi and Brad May, plus their wives. There comes a time for forgiveness for a mistake, and Sakic said he believed that time had come by 2008 — if not sooner. The other point in Bertuzzi’s defense was that the lawsuit effectively tied tongues, meaning he couldn’t openly discuss what happened and attempt to explain himself, and that arguably even ruled out an extensive public apology that went beyond the statement he read two days after the incident. And, again, the Moore camp had rebuffed early attempts at a direct apology before the specter of legal action came into play. By early 2012, two other suits tied to the case had been settled. Those suits were Bertuzzi against Crawford, and the Canucks’ ownership against Bertuzzi. Effectively, Bertuzzi’s “third-party” suit added Crawford as a defendant, while Orca Bay’s suit against Bertuzzi was a claim that the player acted on his own in attacking Moore. So as the case moved forward, it was Moore vs. Bertuzzi and the Canucks. In December 2013, with the trial still pending, Moore broke his long-held media silence, answering questions from me and two other reporters — Bob Duff and Mark Spector — in a conference call set up to discuss the Steve Moore Foundation. The charity was officially formed in 2010, but the announcement was the official unveiling after fundraising and other groundwork. Moore said one of the foundation’s missions was to be a source or a clearinghouse for information about concussions and head injuries. He said that after the Bertuzzi incident, “I spent the following five years after the injury trying to recover, to return to my NHL career, which basically consisted of me going around to see any and every doctor I could find that I thought was a leader in this area and who might he able to help me. “After about five years of doing that, I was told I had made remarkable progress, but I still won’t be medically cleared to return to play. That was a very difficult time for me. I spent my whole life, from the time I was 2 and a half years old, dreaming of playing in the NHL. Despite being off for that long, it still was very difficult for me to accept. He said he would welcome the opportunity to somehow link the foundation’s work to the Avalanche. “I obviously think fondly of my time with the Avalanche and I obviously feel very connected to the people of Denver and the state of Colorado who have been incredibly supportive of me, obviously from the moment the incident happened, even through today,” Moore said. A final delay pushed the scheduled trial date back to September 8, 2014. On September 4, word came that the two sides had agreed to an out-of-court settlement. It was more than 10 years after that eventful night in Vancouver. “The legal case for the loss of my NHL career is over. I have accepted a settlement agreement which has now been finalized and signed by all the parties.This day comes with mixed emotions. I am extremely thankful for the compassion and encouragement of so many people over the past decade. These years have been very difficult for me and my family. “The injuries I sustained in my rookie year, the years I spent trying to return to my NHL career, and dealing with the loss of my career and the ensuing legal case, have been long and trying experiences. While nothing replaces the loss of one’s dream, I am happy my family will no longer be burdened by an unresolved legal case, and I am grateful to be able to move forward. “I thank the fans and the public who have supported me so passionately and tirelessly, not just across Canada, and the U.S., but around the world — your support has meant more than you can imagine. I thank the people who supported me in this legal case; your courage, and integrity are an inspiration. . . Finally, I thank my friends, and especially my family, for your unwavering love and devotion which kept me going over these last ten years. Bertuzzi played 1,159 NHL regular-season games with Vancouver, Florida, Detroit, Anaheim and Calgary. Nearly half of them — 531 — were after March 8, 2004. The last one was with the Red Wings on April 13, 2014, or five months before the settlement was announced. The journeyman forward named Moore turned out to be Steve’s brother, Dominic, who has played with 10 NHL teams, and at age 37 is in his second stint with the Maple Leafs this season. Steve Moore and his wife, Sharon, have three young children and live in the Toronto area.